The aim of this work is to convert agroforestry residue to a novel adsorbent (M-1CTA-SDS-BT) used for adsorptive benzene sequestration from aqueous solution. In this study, the anionic surfactant-coated-cationized banana trunk was synthesized and characterized for batch adsorption of benzene from aqueous solution. The surface morphology, surface chemistry, surface area, and pore properties of the synthesized adsorbents were examined. It was proven that surface cationization successfully increased the benzene adsorption capacity of sodium dodecyl sulfate-coated adsorbents. The Langmuir isotherm model satisfactorily described the equilibrium adsorption data. The maximum benzene adsorption capacity (qmax) of 468.19 μmol/g was attained. The kinetic data followed the pseudo-second-order kinetic model in which the rate-limiting step was proven to be the film diffusion. The batch-adsorbent regeneration results indicated that the M-1CTA-SDS-BT could withstand at least five adsorption/desorption cycles without drastic adsorption capacity reduction. 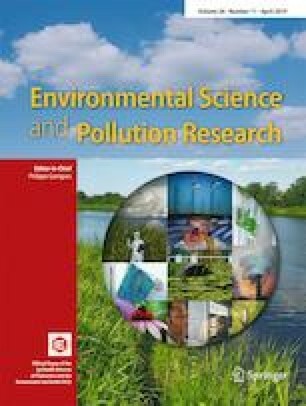 The findings demonstrated the adsorptive potential of agroforestry-based adsorbent as a natural and cheap material for benzene removal from contaminated water. The online version of this article ( https://doi.org/10.1007/s11356-019-04248-5) contains supplementary material, which is available to authorized users. The financial support of the Research University Grant (GUP Grant Nos. 00H63and 06H85), the Ph.D. scholarship from the Universiti Teknologi Malaysia (UTM) and UTM Post-Doctoral Fellowship Scheme (PDRU 04E09 and 04E29) awarded to Helen Kong and Norasikin Saman are gratefully acknowledged.